In 1781, Virginia was invaded by formidable British forces that sought to subdue the Old Dominion. Lieutenant General Charles, Lord Cornwallis, led thousands of enemy troops from Norfolk to Charlottesville, burning and pillaging. Many of Virginia's famed Patriots—including George Washington, Thomas Jefferson, Patrick Henry and Nathanael Greene—struggled to defend the commonwealth. Only by concentrating a small band of troops under energetic French general the Marquis de Lafayette were American forces able to resist British operations. With strained support from Governor Jefferson's administration, Lafayette fought a campaign against the veteran soldiers of Lord Cornwallis that eventually led to the famed showdown at Yorktown. 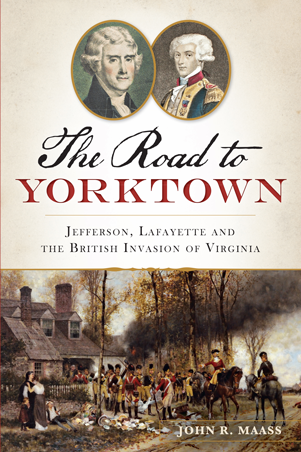 Historian John R. Maass traces this often overlooked Revolutionary struggle for Virginia and details each step on the road to Yorktown. John Maass is a historian at the U.S. Army Center of Military History, Fort McNair, Washington, D.C. He received a BA in history from Washington & Lee University, an MA in U.S. history from the University of North Carolina at Greensboro, and a PhD in early U.S. history from the Ohio State University. He is the author of North Carolina and the French and Indian War: The Spreading Flames of War (The History Press) and Defending a New Nation, 1783-1811 (U.S. Army Center of Military History).